Show Of The Summer is THE hottest show and it’s back for 2018 at Hershey Park on August 4th. Now in it’s fourth year, SOTS brings the best of the best to Hershey and this year’s lineup is stacked! Why Don’t We, Troye Sivan, Maggie Lindemann, Ayo & Teo, and more will bring the heat to HersheyPark Stadium for one of the hottest shows of the Summer. Shows at Hershey Park are truly the best with a theme park steps away from the venue, you’re sure to bump into your fave while waiting in line for a ride before the show. General Admission tickets & VIP packages are available now. VIP packages include a front row ticket, signed poster, VIP parking close to the venue, HersheyPark ticket with FastPass, exclusive VIP goodie bag, and a meet & greet with SOTS artists! Visit ShowOfTheSummer.com for more info. Check out the Show Of The Summer flyer and get your tickets now! Be sure to follow Why Don’t We, Troye Sivan, Maggie Lindemann, Ayo & Teo, Hrvy, Charlie Hanson, and Secret Fangirls on Twitter. Show Of The Summer must live by the “go big or go home” motto because they announced not one but two dates for this year! The first show is at Chicago’s Hollywood Casino Amphitheater and marks the first SOTS to be held in the Midwest. The second SOTS will be held at the legendary Hershey Park Amphitheater just next door to Hershey Theme Park. You can count us in for riding roller coasters with the superstars they’ve got lined up for this year’s show! This year’s line up is stacked top to bottom including former front woman for Fifth Harmony, Camilla Cabello, Disney Channel’s Sabrina Carpenter, Alex Aiano, AJR, Jacob Sartorious, and Forever In Your Mind. This year VIP packages include front row seats for the show, meet & greets and solo photos with your favorite artists at SOTS, posters, and more! Hersheypark VIP packages include tickets to Hersheypark with fast passes to jump the line while Chicago VIP packages include a backstage party with games and more. VIP Packages and general admission tickets go on sale starting on Friday April 28th at 12noon local time. Watch the announcement video below and get hype for the best Show Of The Summer yet! Be sure to follow Show Of The Summer and Secret Fangirls on Twitter! 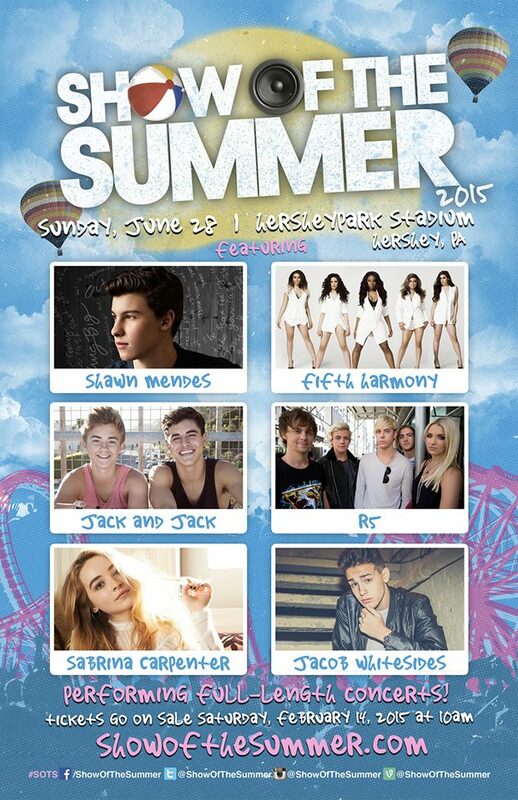 Show of the Summer Returning to Hersheypark in 2016 with Shawn Mendes, Jack & Jack & More! We know one thing Shawn Mendes did last summer… he played a killer show at Hersheypark! He’ll be back in August for the second year in a row headlining the Show Of The Summer! We couldn’t think of a better name for the mini-festival, which features Shawn Mendes, Jack & Jack, Sabrina Carpenter, The Girl & The Dreamcatcher and Harletson! You don’t want to miss this! You can spend the day riding coasters at Hersheypark before hitting the concert in Hersheypark Stadium. Tickets including VIP Packages with artist meet and greets go on sale this Saturday, February 20th! You’ll also be eligible for a special discounted Hersheypark admission with your concert ticket. Head over to ShowOfTheSummer.com for more info! Watch the video for “I Know What You Did Last Summer” by Shawn Mendes and Camilla Cabello below. Be sure to follow Show of the Summer & Secret Fangirls for more updates! Your bae Shawn Mendes will always be there for you. He just released another new track called “Never Be Alone” off his hotly anticipated debut album “Handwritten.” Listen to the song below! If you preorder the album on iTunes now, you will receive “Never Be Alone” along with three other songs instantly! Shawn also has a deluxe preorder package available on his official web store that includes a book filled with exclusive photos and even handwritten lyrics. Don’t miss Shawn Mendes at the Show Of The Summer this June with Sabrina Carpenter from “Girl Meets World” live at Hershey Park. Click HERE for tickets and more info. Be sure to follow Shawn Mendes & Secret Fangirls on Twitter! Shawn Mendes, Fifth Harmony, Sabrina Carpenter, Jacob Whitesides, R5, and Jack and Jack are all coming to Hersheypark on June 28th. With a lineup like this, it’s guaranteed to be the Show Of The Summer! It might be the perfect summer venue – you can even hit the theme park for a few hours before the concert. VIP packages are available, and include a meet & greet with the artists before the show! Visit ShowOfTheSummer.com and VIP Nation for more info. Hersheypark Stadium is also home to another fangirl fest – the Mixtape Festival, happening on the same weekend with NKOTB, TLC, Vanilla Ice & more. Can you say best weekend ever? Tickets go on sale Saturday, February 14th!